If you are looking for the perfect NOLA experience, you've found it! 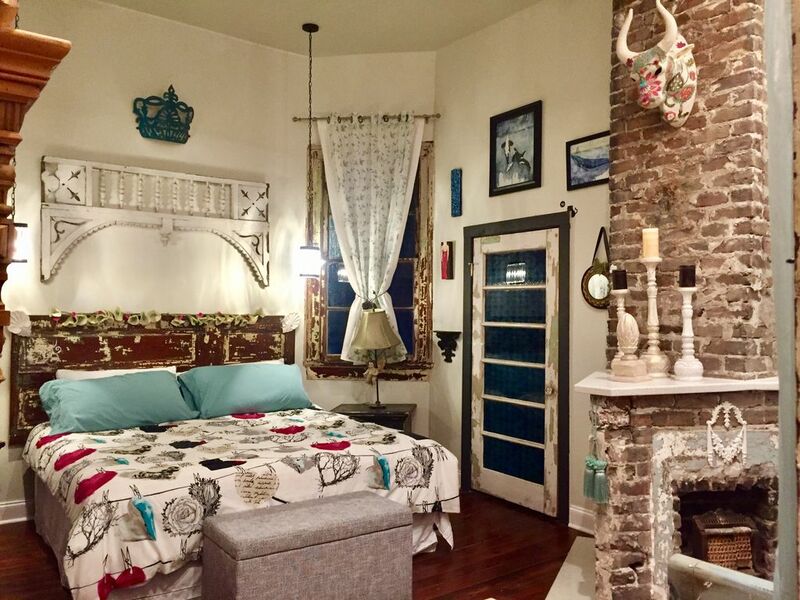 My completely remodeled, 100 year old, eclectic 3 bdrm/2 bath home is the perfect home base for your New Orleans vacation. Come visit this urban neighborhood and live like a local for a few days. You won't find another home like this! With 13 foot ceilings throughout, every room is bright, comfortable and a unique artistic experience. Three short, walkable blocks to St. Charles Ave. where you can catch the Street Car and take it most anywhere in town; into the French Quarter, Downtown, through the Garden District and up to Carrolton just to name a few. Stay here and make this a trip you'll never forget. THE HOUSE: You won't find another home like this! It offers unique design elements such as an upcycled dining table that is made from an old shuffleboard table. A collection of old telephones adorns the front wall. The original millwork has been preserved for that old New Orleans feel. It has four beautiful original (nonworking) fireplaces and the original hardwood floors throughout the house add that turn of the century quality to this eclectic home. Relax with your coffee or glass of wine on the front porch or the back deck and enjoy the sites and smells of New Orleans. The home was renovated from the ground up this year with all new plumbing, electrical, heating and air conditioning. THE EXPERIENCE: I believe NOLA is the best city. Whether you are coming for business or pleasure, I LOVE helping my guests have the best possible experience on their trip to the Big Easy. I have an updated welcome book that is filled with lists of all of my favorite restaurants, bars with places to see and things to do. Once booked, I will send you a welcome letter with suggestions and ideas and tips on how to make the most of your stay here so you can start planning where you want to go and eat before you even arrive! I'm always happy to help with any suggestions to help fit your groups needs. If you'd like, I have a personal shopper that can stock the house with groceries before you arrive or a chef that can come cook a special meal for you and your guests. If you stay at the Carriage House I'll do everything in my power to assure you have a terrific experience in New Orleans. I spent half my life in New Orleans and half in Aspen growing up and now I'm lucky enough to live in sunny San Diego. But my heart belongs to the South. I am an artist through and through. I also love water sports that are ON the water (not in). I've loved Outrigger Paddling for years and now I've been trying Rowing. Living in San Diego, you want to be outside as much as possible! I LOVE food! I love cooking it, eating it, creating it and sharing it. I think the food scene in NOLA is to die for! And don't get me started on the music, art, architecture, Southern accents and hospitality, scenery and smells down there! Just waking up in this city feeds my soul! I'm a wife with an amazing husband and mother of 2 extraordinary teenagers away at college. I can't believe I'm finally lucky enough to have not one buy TWO homes in NOLA that I can use AND share with others. toilet, shower, Master bathroom has walk in shower, toilet, sink. We had an amazing time at The Carriage House. We were just a few blocks from the streetcar on St. Charles, and we had lots of room in a beautifully decorated space. Amazing home with everything you need for a great stay! We had to make ourselves stop exploring the house and get out in the city! This was our first stay in one of Holly’s homes but defiantly won’t be our last. Thanks so much, Holly for a wonderful stay! This area is quickly being gentrified and this house is a MUST STAY for anyone who is going to NOLA. I was absolutely FLOORED at all of the things that just kept unfolding as we stayed for almost a week. One day the light shone just right onto a wall that I had been walking past for three days and there, lit up like a mirage was a stenciling of a white fliget on a white wall. It took the PERFECT light coming in from the vintage windows to even SEE it. The details are over the top. The informative books and informational binders put together by the homeowner are second to none. We go to NOLA at least twice a year and have never stayed in the Garden District. This former carriage house is laid out PERFECTLY and is centrally located to the Quarter, the Superdome, walking distance to several cemeteries, and just a dream to stay in. BRING YOUR TOOTHBRUSH because you won't need ANYTHING else! Congrats on THE best place that we have yet to find in 9 years of traveling to NOLA. front room 15 degrees colder. Place has large gaps in the walls , windows, door and cold air flows in. Portable heater barely helped. Tub shower is very awkward, guests did not like the shower curtain sticking to them every time. Master bathroom was much better. Otherwise a delightful stay. The Carriage house certainly lived up to my expectations! There was something new to see at every turn. I found it very comfy and cozy. Holly was wonderful about answering any questions we had. The house was a little drafty in the front room, but what do you expect from a 100 year old property. We didn't typically spend that much time there, after all we were there to see New Orleans before hopping a cruise to the Western Caribbean. It was so easy to get to the St Charles streetcar and navigate the city with the streetcar system. We walked down to the Garden District and ate on Magazine street at a restaurant that was mentioned in the book. There was a little corner market about a block away, so that was convenient. I am definitely going to come back to New Orleans and explore more. Everything was quite charming! This house was a perfect choice for our sister's trip to NOLA. The location was very convenient to everything we had on our agenda. We were able to get everywhere we needed to be via streetcar or a short Uber ride. The home itself, was such a fun place to stay. The layout is perfect --the kitchen/living room area is great for gathering as a group, with the rest of the home being large enough to give guests room to spread out. We so enjoyed the décor of the home--there were so many unique things, it was fun just to spend time exploring the home. Holly was a wonderful host. The home was well stocked with paper goods, towels, etc. She also provided a binder full of information on things we should do/places to eat/what to do if we had trouble with anything. Holly was also very diligent in helping me clear up a booking issue (my error), which caused extra work on her end, with a lot of back and forth between her, myself and VRBO. (Thanks again, Holly). Based on location, the home itself and the responsiveness of the owner, I would choose to stay in this home again when I get another chance to visit NOLA.